The Reserve Bank of India (RBI) holds its monetary policy meeting on Wednesday, February 7. This is another significant policy event for local markets after last week’s Federal Budget. The budget for fiscal year 2018-19 (April-March) failed to arrest the selling pressure on government bonds underway since August last year. And the unanimous consensus behind an on-hold RBI rate policy decision offers no hope either. The upward revision to the government’s budget deficit estimate for FY2017-18 to 3.5% of GDP from the original plan of 3.2% together with the likelihood of another deficit overrun in FY2018-19 – the election year – above the 3.3% plan, has almost halted the consolidation of public finances toward the 3% deficit target, the timing for which is now pushed out to FY2020-21. The announcement spooked the bond market further, sending yields on the 10-year bond up by 18 basis points to an almost two-year high of 7.6%. The increase in the government borrowing requirement to finance wider budget deficits complicates the RBI's policymaking while containing inflation remains the primary goal of monetary policy. At 5.2% year-over-year in December, consumer price inflation has surged past the RBI’s 4.2-4.6% forecast for the second half of FY2017-18. While we expect inflation to be sticky downward (resistant to moving down) going forward, the risk of it breaching above the RBI’s 2%-6% medium-term policy target cannot be ruled out. 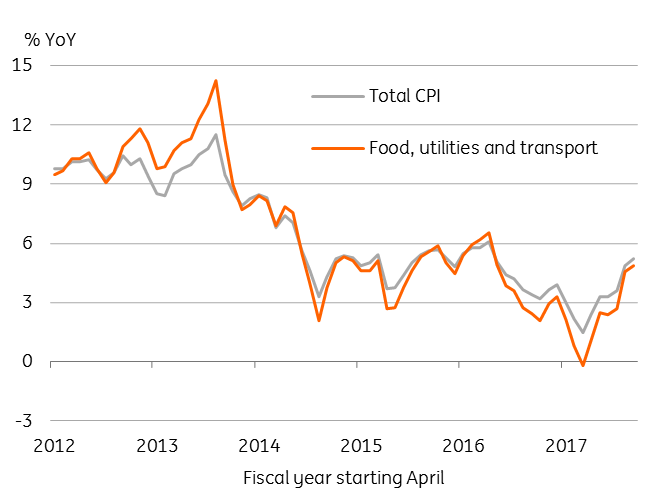 The budget announcement of hikes in the minimum support price for agriculture produce will sustain upward pressure on food prices- almost half of the CPI basket. The pass-through of rising global oil prices to domestic fuel prices is an additional factor. And now we have rising inflation expectations from fiscal slippages making the matter worse. Still, higher interest rates not only worsen the market for government borrowing, they also hurt demand for already-weak private investment. What's more, tighter policy leads to the deterioration of banks’ balance sheets, especially those of public sector banks with a high level of non-performing assets. Higher public spending crowding out private spending will be a further hit to the economy’s growth prospects. This is not a favourable economic backdrop for the 8% GDP growth that the Modi administration is dreaming about to boost its chances for re-election next year. The central bank can't help to achieve it either by easing monetary policy anytime soon. We reiterate our forecast of no change to the RBI rate policy throughout 2018, which is also the broad consensus view. 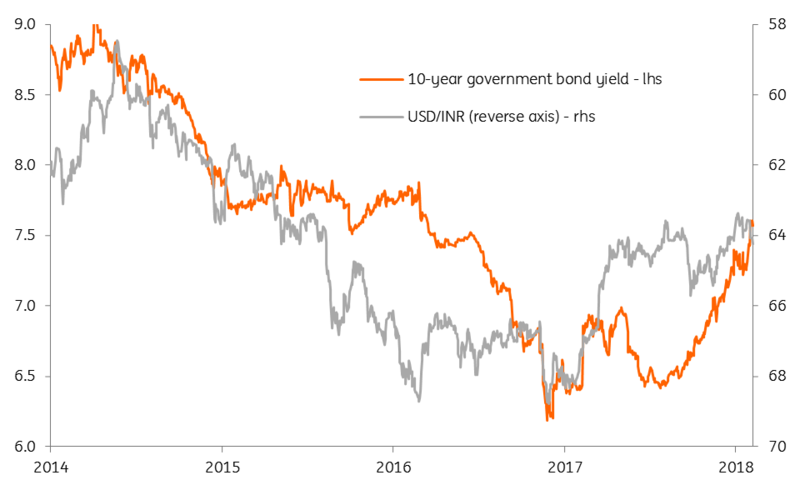 We expect continued weakening pressure on government bonds and the Indian rupee (INR) this year. We revise our end-2018 USD/INR forecast from 64.5 to 65.0 (spot 64.3, consensus 64.5).